Sub-Title: A Map of Soudan. 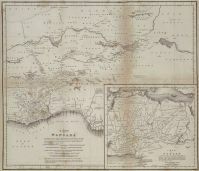 Compiled from Manuscripts and Information obtained at Coomassy of the Courses of the Rivers, and of the central Regions of Africa; Their bearing from Ashantee and distance, according to the reported Journies of Days, Marches &ct By J. Dupuis. Consul. Notes: This map is from the Afriterra book #141, 'Journal of a Residence to Ashante' first edition, Joseph Dupuis.